C&IT's Best Event Solution to a Business Challenge award was won by Rapport for its ONE Astellas Live event, which was commended for its interactive broadcast to 4,700 people across 21 countries. Judges unanimously agreed that ONE Astellas Live was a "stellar entry, magnificently executed". 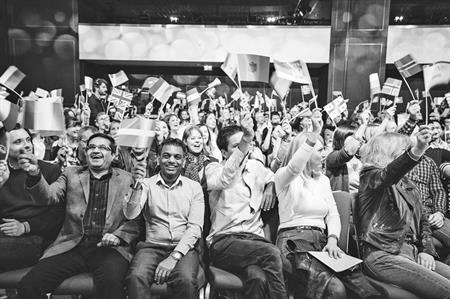 Astellas Pharma Europe celebrated its 10th anniversary this year and wanted to present its vision for the next decade to all of its employees at the same time. The challenge was to find a way to bring together 4,700 people, from 43 offices and 21 countries. The objective of the anniversary celebration was to create a sense of pride and community and underline how much Astellas values its employees and the importance of their role in the company’s achievements. Rapport created a live TV-style event enabling all delegates to see and hear each other through a two- way interactive broadcast. Hosted in London, the broadcast bounced between 16 countries throughout the day; each staging segments that focused on company values, local culture and their achievements. All of this was created through the 535 employee stories – films, poems, letters and music. Feedback was overwhelmingly positive – 86 per cent said the event made them proud to work for Astellas and 87 per cent said it made them excited about their future at the company.